Use tiny beads to make flowers that will last a lifetime. Learning how to make a beaded flower bouquet is a great way to add a new dimension to your passion for jewelry making. Beaded flowers are versatile and surprisingly fun to make! Beaded flowers, sometimes called French beaded flowers, are made by artfully wrapping wire around several rows of tiny beads. Any size of beads can be used, but 11/0 or 10/0 seed (rocaille) beads are the most common. Once completed, beaded flowers can be used wherever you would use silk flowers. They can be used to make pretty flower arrangements and to create hairpieces for special occasion outfits to wear to weddings, anniversary parties, or formal dances. You can also use your flowers to decorate around your home by adding them to napkin rings, wall hangings, or wreaths. 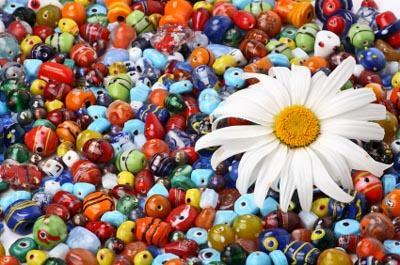 Beads: You're going to need a lot of beads to make your flowers! One tiny flower can easily use well over 1,000 seed beads. Since seed beads are fairly inexpensive, you may want to buy in bulk and simply plan on using the excess for another project. Wire: Many beaded flower patterns use colored Artistic Wire. In most cases, the color of the wire should match the beads as closely as possible. Wire cutters: Don't cut your wire with scissors, since this can start to dull the blades. Pliers: Round nose pliers are an essential tool for making beaded flowers, since you'll need to bend and twist several wire strips in order to give your flower the desired appearance. Floral tape: You'll use floral tape to add shaping and stability to your beaded flower arrangements. Light source: Making beaded flowers is very detailed work, so it's important to make sure your craft area is comfortable and well-lit to avoid unnecessarily straining yourself. You may also want to print a copy of the Basic Beaded Flowers Techniques tutorial to keep near your workspace in case you run into trouble with a particular aspect of your project. Instructables has a free beaded wedding bouquet pattern. Offbeat Bride has a gorgeous blue and white bouquet pattern tutorial. Although she uses it for a wedding, it would be suitable as a centerpiece. Beaded Flowers Patterns has a gallery of bead flower projects, plus links to books and patterns you can buy to start creating your own projects. Martha Stewart offers instructions for a variety of beaded flower accessories - perfect for novice and advanced beader alike. Since beaded flowers are fairly uncommon in most parts of the United States, learning how to make a beaded flower bouquet can be a smart business move. Beaded flowers are great crafts to sell, especially if you're willing to take custom orders for weddings.